St. Louis University High School’s #12, Andrew Cross, tried to block the ball at the net against Lafayette’s Chris Harstick. St. Louis University High School Billikens beat Lafayette High School Lancers 2-3 to win the Class 4 Volleyball state championships. Two Catholic schools from the archdiocese made the finals of the Missouri Boys Volleyball State Tournament, with St. Louis University High School completing an undefeated season in Class 4 and St. Mary’s High School falling just short of a state title in Class 3. SLUH defeated Lafayette 25-22 and 25-16 May 24 at Webster Groves High School to win the title. The win was the Junior Billikens’ third championship in four years and ninth since 1997. SLUH lost in three sets to Lafayette last year. After Lafayette tied the first set 19-19, SLUH pulled away for the win. In the second set, Lafayette tied the set at 7-7 before the Junior Billikens surged ahead, gaining confidence after key points scored by Andrew Cross, Nathan Langhauser and Matt Coplen. A joyous SLUH coach Jeff Cheak said it felt good to watch his players succeed and their hunger to regain the championship title. He praised Lafayette as an outstanding competitor. The seniors are leaders on and off the court. Included are the student council president and student council members as well as “guys with crazy-high GPAs,” their coach said. 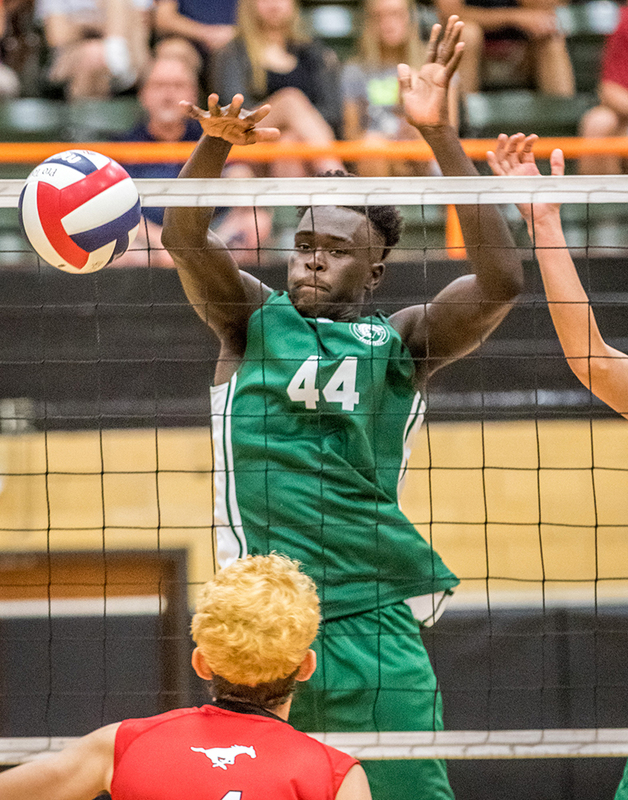 St. Mary’s High School senior Yahuza Rasas blocked a shot at the net against Parkway Central in the Class 3 volleyball state championship match. Parkway Central beat St. Mary’s to claim the title. St. Mary’s battled hard before falling to a resilient Parkway Central team 25-20, 27-25. The first set had several lead changes until Parkway Central pulled ahead 13-12, keeping the lead for the rest of the set. In the second set, St. Mary’s and Parkway Central traded leads again, with St. Mary’s having a chance for the win when they gained a 25-24 lead. The second-place finish was a repeat from last season, and the year before St. Mary’s lost in the semifinals, both years falling to Parkway Central. The Dragons have a strong moral character and they support one another, Chittakhone said. It’s bolstered by prayer before games, he added. Yua Rasas, a senior with 11 kills, scored points at several keys points, spiking the ball with authority. He gave credit to Parkway Central. “They played hard, we played hard but they were able to repeat,” Rasas said.